If you wish to have salon beautiful every day at the comfort of your home then SYOSS is your new BFF. 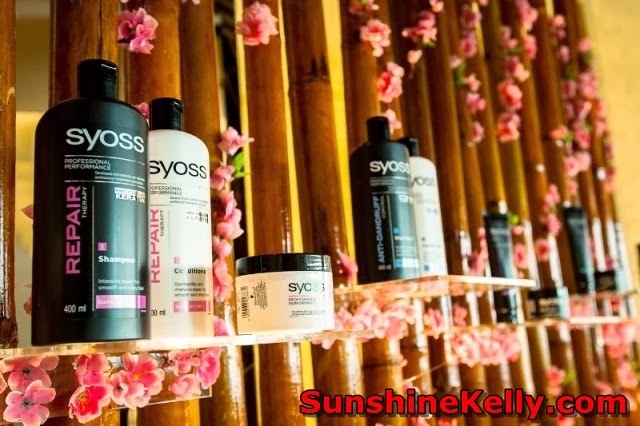 SYOSS Professional Hair Care & Hair Styling range that is affordable from Japan was debut in Malaysia on 21st January 2014. The name SYOSS is a result of the significant collaboration between Sharp and Yamahatsu in Osaka dated 1977. SYOSS was established in Japan 37 years ago, the products were developed and tested by top Japanese professional hairdressers and stylists. 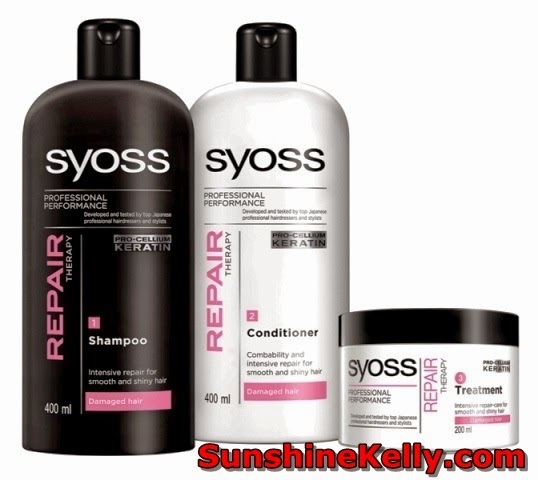 SYOSS Hair Care series offers a range of shampoo, conditioner and treatment with three sub-lines SYOSS Repair Therapy, SYOSS Moisture Intensive Care and SYOSS Anti Dandruff Control to answer to the most important hair related problems. The SYOSS Hair Care series contains Pro-Cellium Keratin, a highly efficient formulation especially developed by top Japanese hairdressers for Asian hair. The professional technology strengthens the hair fiber from within and is used by thousands of hairdressers worldwide for all hair types. To top it off as a professional’s, the fragrance is designed and tested specifically for Asian taste by leading Japanese fragrance expert. It is light with a fruity-floral top note and a caring base. SYOSS Repair Therapy aims to counter issues faced by damaged, stressed, coloured or permed hair in order to restore the shine that it deserves. SYOSS Moisture Intensive Care, on the other hand, targets to moisturize dry, frizzy and brittle hair leaving it smooth and healthy while SYOSS Anti Dandruff Control proves to be effective to reduce dandruff from the first application. Walk out of your home feeling confident and flaunt the hairstyle that complements you perfectly with SYOSS Hair Styling range. SYOSS Hair Styling range comprises Strong Hold, Straight & Shine and Curl Control sublines. SYOSS Styling Strong Hold comes in the forms of wax and gel. This series contains a fast drying formula and is ideal for demanding hairstyles. With the innovative non-sticky gelee texture, SYOSS Styling Straight & Shine keeps your straight hair intact with its gel and wax products. If you like to wear the big curly hair, SYOSS Styling Curl Control range is making it achievable without you stepping into the salon and at the price you love! The professional formula of the SYOSS Styling Bouncy Curl Airy Curl Cream nurtures the hair and provides soft touchable curls without stiffness and stickiness. Its light formula gives the hair instant and natural shine. SYOSS Styling Bouncy Curl Bouncy Whip promotes voluminous and defined long lasting curls with perfect bounce and smoothness. Now you can do up that big curly hair you’ve always wanted. Walk into the room with pride and glam, the limelight is all yours. The girls will envy you but the boys will love it. Among the success stories from China are: SYOSS Moisture Intensive Care hair care series set the record and clinched the Cosmopolitan Beauty Awards in 2011, SYOSS Styling Strong Hold Wax stamp their footprint on Self Magazine by winning the Best Styling for Short Hair in 2011 while in Bazaar Men, SYOSS Styling Strong Hold Wax came out Top in the Best Wax category. SYOSS is available in more than 50 countries worldwide. In Asia-Pacific, SYOSS is available in Japan, South Korea, Thailand, China, Vietnam, Taiwan, Indonesia and Malaysia. 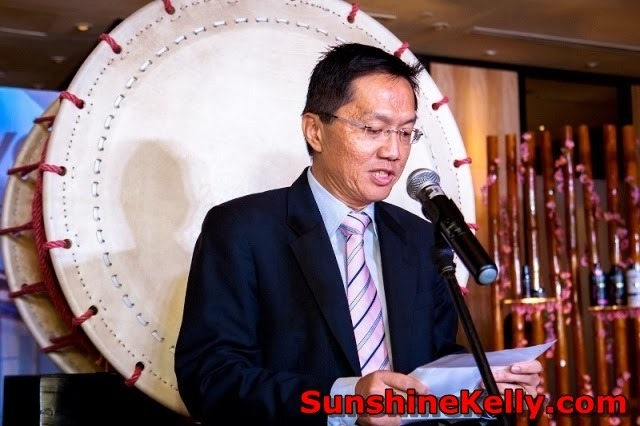 Christine Fan or more commonly known as Fan Fan, is the Asia ambassador for SYOSS. Fan Fan is always seen with her long healthy and hair both on screen and behind scene. The Taiwanese singer, actress and host, particularly loves the fact that she can keep her hair healthy with a ‘salon shine’ even at home. Joining the SYOSS product launch are JoJo Struys - TV Host/Wellness Author and radio personality, Karena Teo - Regional Artiste / Actress and Dynas Mokhtar – Host, actor, model who testified their experiences with the new products. They strongly agree that they will be recommending SYOSS to their friends and families for it is effective in combating hair problems and the ability of the products as confidence ‘booster’. The Japanese hairstylist, Daisuke Hamaguchi makes a special appearance during the product launch and demonstrates how customers can use SYOSS hair styling products to produce head turning hairstyles. Hamaguchi is also the dedicated stylist for a number of Japanese models, actresses and celebrities. In Kuala Lumpur, Hamaguchi takes on the role as the Chief Executive Officer and technical hair educator for “Number76 Hair Salon” which has two branches and made it to be the official hair salon for the Japanese fashion magazine, Vivi Malaysia. SYOSS Hair Care and Hair Styling range will be available at all major departmental stores and selected pharmacies. The price of the products ranges from RM9.90 to RM23.90. SYOSS retail products are available at major pharmacies, hypermarkets and supermarkets nationwide.